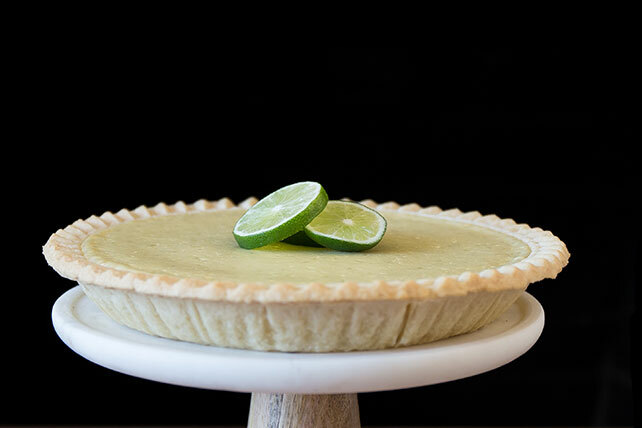 Our lime pie isn't just easy and creamy. It's also super citrusy, thanks to fresh lime juice and grated lime zest. Prepare crust in 9-inch pie plate as directed on package for one-crust filled pie. Blend all remaining ingredients except COOL WHIP in blender until smooth. Pour into crust. Bake 20 min. or until center is almost set. Cool completely. Refrigerate 3 hours. Serve topped with COOL WHIP. Save 30 calories and 4g of fat per serving by preparing with PHILADELPHIA Neufchatel Cheese and COOL WHIP LITE Whipped Topping. For a crispier crust, heat oven to 450°F. Line pie plate with pie crust as directed on package for baked shell; prick bottom and side of crust in several places with fork. Bake 6 min. ; remove from oven. Reduce temperature to 400°F. Add prepared filling and continue as directed. Note: After pouring prepared filling into pie shell, shield edge of crust with strips of foil to prevent it from becoming too brown. Slice additional lime. Use to garnish pie just before serving.